Seatrade Cruise Med - the largest cruise industry event focussed on the Mediterranean and its adjoining seas - will move to Málaga, Spain, in 2020 it was announced on the final day of the event in Lisbon, Portugal. 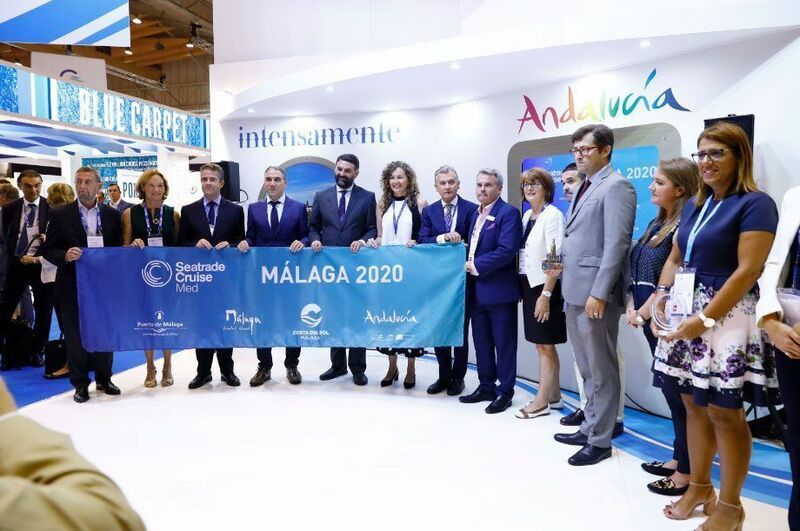 Seatrade Cruise Med will take place in Málaga from 15-17th September 2020 at Palacio de Ferias y Congresos de Málaga (Trade Fairs and Congress Center of Málaga). The event will be hosted by Port of Málaga; Andalucia; Costa del Sol and City of Málaga. A Mediterranean port with nearly 3000 years of history, Málaga will become the 13th destination to host Seatrade Cruise Med which is held biennially in different locations around the Mediterranean and includes an international exhibition, detailed conference programme and excellent networking opportunities. According to Vanessa Stephens, Global Events Director of Seatrade, organisers of the event: “We are delighted to announce today that the next destination for Seatrade Cruise Med is Málaga, the capital city of the Costa del Sol. An ideal cruise destination, Málaga is strategically located in southern Spain between the provinces of Granada and Cadiz, and nearby the provinces of Seville, Cordoba and Granada, all of which are UNESCO World Heritage Sites. Currently regarded as one of Europe’s best access points by land, sea and air, Málaga was awarded Europe’s best shore destination in 2015, supported by one of the best climates in Europe as it enjoys more than 325 days of sunshine each year. Malaga Cruise Port manages all three cruise terminals of the Port of Malaga which is located just 15 minutes away from Malaga International Airport, which offers flights to and from Europe and all around the world making Malaga’s port facilities, hotels and airport a truly world-class international homeport. The three cruise terminals: Terminal A, Terminal B and the Palm Grove Terminal allow Malaga to receive cruise ships of any sizes from all over the world. Larger cruise liners dock in the eastern area and smaller cruise ships dock at the inner basin next to the Palm Grove waterfront, which is within five minute’s walking distance to the cathedral. There are full turnaround and transit services as well as a small shopping center offering duty free and souvenir shopping. A shuttle service to the city center is also in operation. All three terminals have been designed with the latest requirements concerning safety and security in mind, and each fully complies with the International Ship and Port Facility Security Code (ISPS Code). Terminal A is equipped with two boarding bridges specially designed for a new generation of ships and has already hosted some of the world’s biggest cruise ships, such as Genesis from RCCL and Dream Class from Carnival. Terminal B has a modern boarding bridge and offers full turnaround and transit services while The Palm Grove Terminal is designed to operate small and mid-sized ships up to 200 m and is located in the heart of the city center.